This is the question behind many of the housing development appeals that come before the City Council. And it’s a tough one. For me, this difficult and complex issue was front and center last week as we heard more than four hours of public testimony — mostly from residents opposed to a proposed nine-home subdivision in Leucadia that we, after serious consideration and the Planning Commission’s earlier unanimous vote, ultimately approved. I’ve spent time on this corner of Hymettus and Fulvia in Leucadia and it is a charming, iconic piece of historic Encinitas. The 2.25 acre former avocado grove on a hill still has a 1924 farmhouse sitting in the middle of it. The 25 neighbors who surround that hill have had the benefit of visual open space, old-growth trees, shrubs, and the relatively rural feel that this sparsely-developed piece of land has provided. More than three years ago, the property owner started the process of developing the land following the zoning code. Because of state density bonus laws, the landowner is legally allowed 10 homes, but after community outcry about too much density, they reduced the project to nine homes. Some of the neighbors have asked that the project be reduced to six homes, but the developer wasn’t willing to go that far. One of the homes is required to be affordable housing, which means its sale or rental price will be heavily reduced and it will only be available to people with demonstrably low incomes. The average lot size for the development is 10,600 square feet, consistent with the lot size of the surrounding neighbors; the homes cover less than 30 percent of each lot, also consistent with the community. So why can’t we just say no to this? None of us wants more traffic congestion. We don’t want to degrade the community’s character. And we certainly don’t want to exacerbate the flooding problems in Leucadia when it rains. But the reality is that the city doesn’t own the property — and the landowner has property rights. At the City Council and at the Planning Commission, we do everything possible to be scrupulously fair — protecting the community while recognizing and upholding the owner’s rights. Residents buy property with expectations about what they can do with their land — sell it to someone else, lease it to a different occupant, borrow against it, etc. They also have the right and the expectation that it can be developed in accordance with the allowed zoning, as long as they follow the rules. This system makes sense to me. We want the rules to be applied evenly. We want clarity, so people know what they are getting when they buy property. We don’t want a system that arbitrarily allows cities to approve or deny projects at any density that they want, based on whim or worse. The zoning code provides consistency, predictability and fairness. We also want clear local rules, like design review guidelines, to ensure that new homes fit within community character. Local and state rules are elaborate, complicated, and technical. In fact, there are so many rules that developers routinely accuse the city and other branches of government of putting so many hurdles in the way of development that the cost of housing is at least 30 percent higher than it would be otherwise. I personally don’t like some of the changes in our community and I understand why residents are opposed to projects like this. I understand the attachment to a piece of land that used to be open space — and now will host homes, people, and cars. The Hymettus Estates site plan; click to enlarge. In the Hymettus Estates appeal, I evaluated the testimony I heard, as well as the extensive amount of information provided in the Hydrology Report, the Environmental Impact Report, the Community Character Study, the Existing Tree Inventory Plan, as well as the information presented at the Planning Commission meetings and by city staff. I didn’t find problems that compromised the community’s health and safety, or evidence that the project did not fit the 18-point analysis of community character, which considered things like rooflines, setbacks from the street, color palette, window style, and garage placement in relation to the 25 homes that face the nine-home development. In fact, six of the nine homes had been redesigned at the request of the Planning Commission to provide more variety, articulation and an eclectic feel. The home styles (modern, farmhouse, craftsman, tuscan, etc.) are impressively varied in an effort to fit into the community of Leucadia. All the homes face the neighborhood, instead of being ensconced behind a wall separating them from neighbors (as some previous Leucadia developments have done). This design orientation will help integrate the new residents into the existing neighborhood and create community. 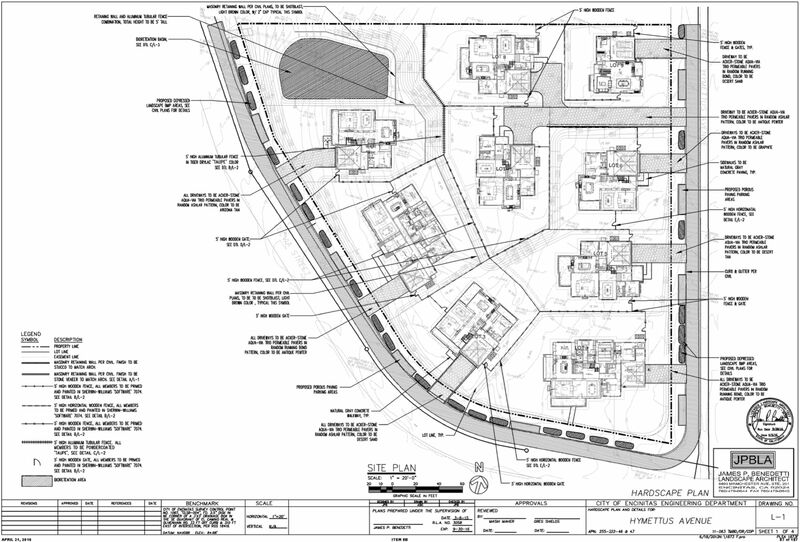 Other changes include removing a proposed decomposed granite path from the plan because neighbors didn’t want a walking path that appeared to go nowhere and didn’t connect to any other path; the bio-retention basins that catch rainwater are substantially more extensive than required, which will help deal with flooding in the neighborhood; and all the concrete driveways will now be built from permeable pavers so water can sink in instead of running off. Without a doubt, the city needs to do more to address flooding in Leucadia, but these improvements that require the development to manage all of the rainwater on site and not overflow into the city streets are a step in the right direction. So, given property owners’ rights, state mandates, and the desirability of our beautiful city as a place to live, what can we do to protect the integrity and precious qualities of our communities? We can advocate at the state-level against laws that will create even more density in our city. This week, the City Council unanimously supported a proposal for me to testify in Sacramento on our behalf against a proposed bill that would restrict the type of information that a city could require from developers seeking to invoke the much-maligned density bonus law. Unfortunately, Assembly Bill 2501 was passed out of the state Assembly this week with a vote of 45-7. Only seven members voted no, which I’ve been told is at least partly due to the fact that Governor Brown has already stated that he wants to pass this bill. Here is a link to the bill, with a summary at the top. Residents in a neighborhood who enjoy having property as open space could get together and buy the property. Alternately, owners could “under-develop” property by building one small home, instead of multiple homes, and leave the rest for their yard and open space for animals and plants. The city wouldn’t be involved in decisions like these — private property owners would be finding solutions to maintain their neighborhoods’ character. The city could buy develop-able property and turn it into a park or a community gathering place. Responding to a strong push from Encinitans, the city purchased the historic bluffside Pacific View school site a couple years ago. If the land hadn’t been purchased by the city to use as an art center, that site would almost certainly have become homes, condos, or a hotel (after a zoning change). Before that, the city purchased 44-acres of former greenhouses that last year opened as the Encinitas Community Park. But beware, these transactions are politically difficult, very contentious, and often expensive. The city could incentivize land uses other than the building of homes, as we did with the recently passed urban agriculture ordinances. This is a small step, but streamlining the process for urban farming means those who want to farm are more easily able to do so. The whole community benefits when our neighbors use their land this way. The city could strengthen its design review guidelines. Currently we’re fortunate to have a very active Planning Commission, with members who have raised the bar for development projects. The City Council and the Planning Commission are both bodies that need to do everything possible to ensure that what gets built is of the highest quality and fits in with the community. The design review guidelines, which are currently a set of broad principles, could be strengthened and given more clarity. There’s no way to sugarcoat the fact that state laws allowing for higher density than the current zoning allows, combined with the desirability of Encinitas as a place to live means that in-fill development will continue in our city. In Sacramento, I’ll soon be arguing that prohibiting cities from requesting studies or information from developers means that we cannot assess the full impact of densification — for example parking, character, crime prevention, etc. I’ll also be pointing out that the bill’s supposed aim, which is to create more affordable housing, is not remotely accomplished by rounding up base density — base density only allows more full-priced, market-rate units. Here’s more daunting news: the legislative analyst’s bureau, which is the research arm for the legislature, is stating that one way to address the statewide housing shortage is to provide even more incentives for developers to build more density bonus projects in every city in the state. There is a perception that cities (especially coastal cities) constrain developers by putting too much red tape and regulation in front of them. No matter how many homes we build in Encinitas, the cost of housing will always be high here because we’re a desirable coastal city and we have protected our community with our zoning and development laws. We need to let legislators know the realities of housing in our city, and the effects of creating more density everywhere. We need to advocate in the strongest possible terms for local control, to decide locally how development should be handled. Every city is different, and we need the flexibility to evaluate the realities of housing here in Encinitas and not be lumped together with every other city in the state. In 1986, we voted to become a city in large part to have the power to protect ourselves against inappropriate development. Encinitas will be working together with the League of California Cities, which also opposes this bill, and some other cities, in our advocacy. It would be valuable if individual residents wrote letters or emails in opposition to Assembly Bill 2501. A pubic groundswell can make a difference. Please write to the legislative director for the bill’s author, Guy Strahl (guy.strahl@asm.ca.gov) and to our local senate representative, Pat Bates (senator.bates@senate.ca.gov), who sits on the Transportation and Housing Committee, which will be hearing this bill. And finally, as your City Council member and if I’m elected as your next Mayor, I’ll do whatever I ethically can to minimize these one-size-fits-all regulations that make it so difficult for us to control our own destiny, and I will always be clear-eyed and fair in evaluating every development project. Speaking of Encinitas’ history, the Heritage Museum is a great place to appreciate our city’s roots. Check it out if you haven’t yet. 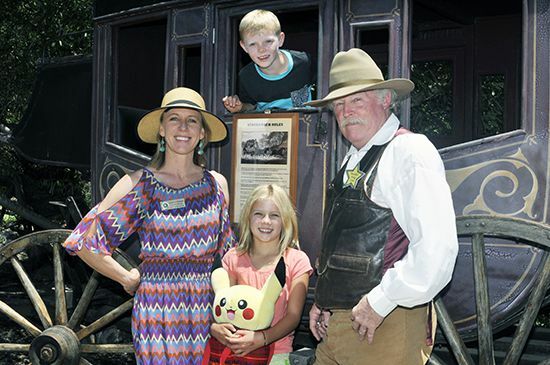 My kids and I had a great time at the Encinitas Heritage Museum’s Deep Pit Barbecue last weekend. At right is “Marshal” Doug Lima Bean (Doug Jones). Photo by Rob McKenzie.